The change from "Crocodile" came during the last months of 1965, when Selmer moved totally away from two-tone cabinet coverings, and adopted an all black cabinet. The fronts of the units were livened up with a smart blue/black grill cloth, with distinctive "sine-wave" pattern woven in. The new amps were introduced at the British Music Trade Fair in September 1965. The control panels of the Big Twins were now situated on the front of the amp instead of on the top as with previous versions. Less noticeable in the Twins was the incorporation of the power-amp sections with the pre-amp in the top chassis, resulting in the name given to these new amps by Selmer employees - "The Upside-Down" amps. Chrome stands, particularly with castors and swivel-back facility, were now very much the fashion, and these were offered as an option on most of the Selmer professional standard combos and speaker units. Just the same as in the croc-skin period, but now in its final guise, the blue/black covering. This amp was internally identical to, and replaced, the previous (1964 to 1966) Futurama Corvettes, but with a Selmer Badge, and with the blue/black covering. Height 12.5" x Width 16.5" x Depth 7.5". Price - 21 gns. The Corvette was also offered without tremolo. Individual volume controls were provided for each input. Another cosmetically upgraded amp, the Concorde 10 was carried over from the Crocodile Period, and given the blue/black covering. In effect, it was a development of the old Professional Amp(TV12/T) from the Red/Cream days, but now fitted with a 12" speaker and revised valve spec. - i.e. 2 x ECC83, 2 x EL84, and 1 x EZ81 rectifier. Dimensions in Blue/Black mode - Height 15" x Width 23" x Depth 9". Price - 30gns. A piggy-back amp/speaker combination, notable for the small size of the valve driven head. There were problems with rectifier overheating due to the size of this amp's cabinet, which are described by John Weir in his memoirs elsewhere on this website. The amp was single channel, with two inputs, volume and tone controls. Valves were 2 x EL506, 2 x ECC82, and two silicon rectifiers. (The EL506 is an obscure valve, difficult to find nowadays. Its modern equivalent is a Model 7868 nine pin power pentode.) Twin 10" speakers were fitted in the cabinet. The Twin Lead 30 was replaced by the All Purpose Twin 30, presumably following rectification of the overheating problem. 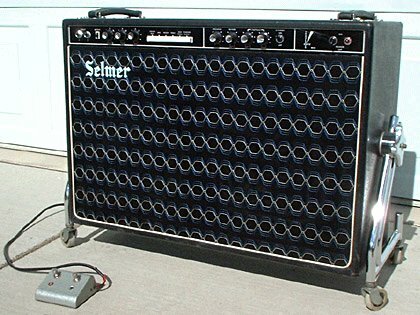 One gets the feeling that these amps were Selmer's attempt to undercut the competition by producing a twin 30 watt amp at a budget price - 75 gns, compared to the Vox AC30's asking price of about 125 gns. The bass version of the Twin Lead 30 amp and cabinet described above. The cabinet in this bass version contained a single (hard-worked) 12" Goodmans speaker. It would appear that two types of speaker cloth were used on the Twin Bass (and probably Twin Lead) cabinet - plain blue and also the conventional blue/black "sine-wave" weave. Both types are shown on the linked page. An upgrade of the earlier croc-skin Zodiac Twin 50. This combo differs from earlier Zodiacs, in that the power amp section is incorporated into a single chassis with the pre-amp, instead of being separate at the base of the cabinet under the speakers. In fact, we understand that Selmer employees used to call the big Blue/Black twin combos the "Upside-Down" models, due to the new orientation of the valves. Twin 12" G12H 25 watt Celestion speakers were fitted. An upgraded version of the croc-skin Thunderbird, with combined pre and power amps in the single chassis at the top of the cabinet. This amp was often fitted with a chrome stand which allowed the unit to be swivelled back for better sound distribution. The selectortone, tremolo, and reverb facilities were retained on the new model, but the amp became single channel only, fitted with just two inputs. Perhaps Selmer understood that the pro player, at whom this amp was aimed, would be very unlikely to allow other instruments to plug in at the same time as himself! For the Beatles enthusiasts amongst us, check out Paul McCartney in the "Famous Selmer Users" Section, playing a Blue/Black Thunderbird 50 combo. Introduced in September 1966, very few of these giants seem to have been made. It is certainly a rare amp nowadays. 100 watts produced by four EL34 valves and fed through four 12" speakers in a very large combination cabinet. The usual Thunderbird refinements, such as "selectortone", spring reverberation, and tremolo. Also a standby switch and presence control - a first for Selmer! Take a look at those pictures though! That is some amp! The T'n'B 50 was probably the longest-running Selmer amplifier in production, from the early 60's to the late 70's, and certainly it sold very well as many are still around and in use today. The Mk II version followed the croc-skin models, and changes were largely cosmetic. Cabinet covering was changed to black vinyl, the front being covered in a very attractive white/blue on black patterned grillcloth similar to designs used by WEM and Vox at that time, with a large light-blue Selmer logo. Handle is leather with Vox-type mounting brackets, and vent grilles are no longer used as ventilation to the back is improved. The chassis was reversed so as to be positioned at the top rather than the bottom of the cab, the control panel being simply inverted 180 degrees to be top-mounted. Normal and Bass channel each have 2 inputs and controls for volume, treble and bass, and an on/off switch and pilot light are provided. On the rear of the chassis are voltage selector, 2 slo-blo fuses and 15 & 7.5 ohm speaker output sockets. Dimensions 21" x 8.1/2" x 8", valve complement ECC83 (3), EL34 (2), GZ34 (1). At this stage, it would appear that 1 x ECC83 was dropped; previous versions had four. This simple, functional and reliable amplifier occupies sonic territory somewhere between Vox and Marshall and can emulate both, probably the reason for it's popularity. Priced at 55 gns. Oddly, the very attractive livery seems to have been used only on the T'n'B and not other Selmer models. Almost as though a cuckoo had landed in Selmer's nest, this monstrous chick appeared in quite different plumage to it's other blue/black nestlings. It's all-metal case design was shared by the Stereomaster and the TV100 PA, which appeared at about the same time. They probably arrived just before the blue/black period, as we have found a Selmer advert showing them amongst croc-skin amps, where they look even more out of place. The design was way ahead of its time, and bears more resemblance to rack-mounted gear of a much later era than the mid-60's. Described as "one of the most powerful amplifiers ever produced", it has two channels. Bass and Normal - the latter having tremolo. Valves - 4 x EL34, 2 x GZ34, 5 x ECC83. Size - 19.5" x 11.75" x x8.5", and priced at 82 gns. Recommended speakers were a pair of All Purpose 50's, two Goliath 50's, or a single Goliath 100. This very advanced amp head had two separate 50w channels which could be utilised as a 2 x 50w stereo amp or as a mono 100w amp. Each channel was equipped with rotary volume, bass and treble controls as well as the Selectortone type bank of five preset tone buttons! The valve compliment was 2 x GZ34, 4 x EL84, and 4 x ECC84, plus two diodes. The price was 99 gns in 1966. At that time, Selmer had the Hofner Verithin Stereo and the Gibson ES 345 Stereo in their catalogue, so the inclusion also of a stereo amp was logical. Introduced to the Selmer range probably September 1965. A very rare "bird" indeed. It does not exist in any of the catalogues of the period that we possess. However, one has actually turned up! Probably a forerunner/prototype for the Black/Silver Thunderbird 100 Head. Whatever, it must have only been produced for a very short period at the end of the blue/black period. The head appears to have the same chassis as the combo. An amplifier unit specifically designed for Public Address and Vocalist duties. Constructed within a metal cabinet, with brushed aluminium front and "D" Handles. Valve Compliment - 4 x EL34, 1 x EF86, 5 x ECC83, 2 x GZ34 plus a diode. Price - 79 gns. Two Selmer TV 4 x 10" column speakers were the designated speaker units for use with this amplifier.